Ministry on billboards is making a comeback. GodSpeaks, a cross-denominational non-profit organization, is posting new messages “signed” by the God of the Bible on billboard s and other media throughout Ft. Lauderdale and beyond. Messages such as “I’ve been here all along. – God” or “Let’s pick up where we left off. – God” will give daily commuters and digital followers something to ponder outside of their busy lives. After more than a decade of silence, GodSpeaks is making a comeback, a move influenced by current cultural trends. “Everywhere around us, people are searching for meaning and purpose in life,” shares Bradley Burck, director of GodSpeaks. “For many, God has never been an option.” According to a 2011 Lifeway Research Survey, statistics show that 46 percent of Americans never think about whether they’re going to heaven or not and almost 70 percent of Americans don’t read the Bible or any other religious texts on a regular basis. The original billboard campaign, developed in 1998 by anonymous donors, attracted the attention of the Outdoor Advertising Association of America and was featured as the OAAA’s national service campaign in 1999. 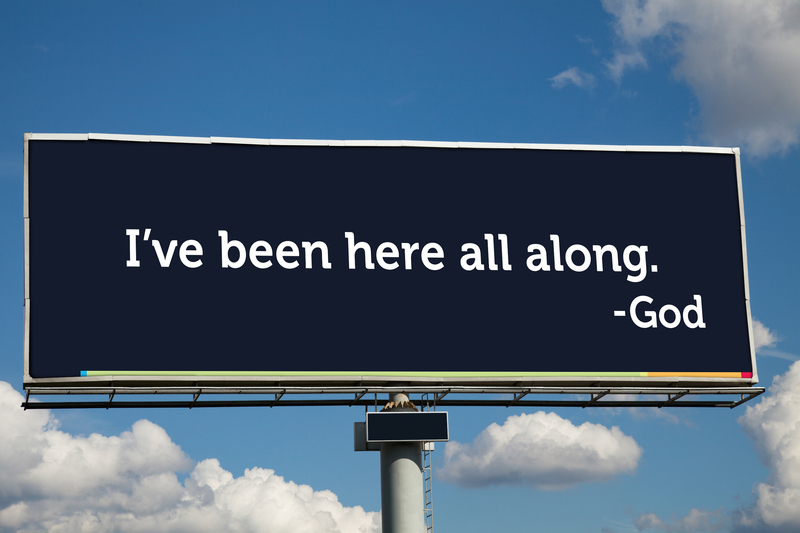 As a result, 10,000 GodSpeaks billboards were posted in 200 cities across America—no small feat for a project that started as a citywide campaign with a handful of billboards and a limited budget. The campaign garnered local, regional and national media attention from CBS, “Good Morning America,” and the “Today” show. Building on past successes, the present GodSpeaks movement promises to be more far-reaching than the first campaign. In addition to billboards, every available type of media will be utilized to spread the messages, including real-time digital responses to natural disasters, social breakdowns and international events. Messages will be positive, relevant and timely, and, with today’s media capabilities, will speak to situations at the points of impact. Since the 90s debut of the campaign, thousands have responded with heartfelt emails and testimonies of God’s working in their lives. Burck remains hopeful that the new messages, particularly given the viral nature of digital and social content, will make a difference worldwide. The origin of each published message can be discovered in specific promises or truths from the Bible. The newly redesigned GodSpeaks.com website offers visitors a closer look at how the Bible verses and messages tie together. It also features short devotionals and lengthier blog posts that further explore message topics. The website directs visitors to partner websites and contacts who are prepared to answer questions about God.